"Seeking and Soaring - Jewish Approaches to Spiritual Direction," by Rabbi Goldie Milgram, Zalman Schachter-Shalomi. Reclaiming Judaism Press offers first book. 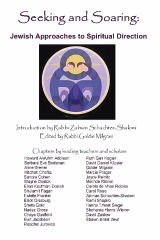 Rabbi Zalman Schachter-Shalomi wrote the introduction to “Seeking and Soaring: Jewish Approaches to Spiritual Direction;” Rabbi Milgram was the editor. The book provides a fascinating opportunity to meet and appreciate many of the leading Jewish spiritual directors, teachers and scholars of our time. Advances in the field of Hashpa'ah, Jewish spiritual direction, are carefully presented with special attention to key issues including session structure, boundaries, supervision, grieving, fear, impulse, addictions, middot and mussar (cultivation of personal ethical qualities) and serving as a doula to the dying. Teachings also present traditional and contemporary Jewish practices regarding intercession, angels, guides, and sacred stories. Unique populations addressed include Holocaust survivors, B'nai Mitzvah students, couples, and those seeking to renew their Jewish spiritual connection. User-friendly scholarly translations occur throughout, as well as guides to working with rare pieces of Jewish spiritual literature. Chapter authors include the following scholars, clergy and Jewish spiritual guides: Philadelphia residents Rabbi Howard Avruhm Addison, Dr. Barbara Eve Breitman, Rabbi Goldie Milgram, Rabbi Marcia Prager, and Dr. Sandra Cohen, as well as Rabbi Anne Brener, Rabbi Mitchell Chefitz, Rabbi Wayne Dosick, Mashpi'ah Ellen Kaufman Dosick, Rabbinic Pastor Shulamit Fagan, Mashpi'ah Estelle Frankel, Rabbi Elliot Ginsburg, Rabbi Shefa Gold, Rabbi Nadya Gross, Rabbi Chaya Gusfield, Rabbi Burt Jacobson, Rabbi Raachel Jurovics, Rabbi Ruth Gan Kagan, Rabbinic Pastor David Daniel Klipper, Rabbi Joyce Reinitz, Mashpi'ah Melinda Ribner, Mashpi'ah Carola de Vries Robles, Mashpi'ah Carol Rose, Rabbi Zalman Schachter-Shalomi, Rabbi Rami Shapiro, Rabbi Hanna Tiferet Siegel, Rabbi Shohama Harris Wiener, Rabbi David Zaslow and Rabbi Shawn Israel Zevit. Proceeds from all sales go to benefit a scholarship fund for students in the Hashpa'ah Program. Although a variety of web vendors sell these books, purchase made via this link ensures that the majority of profits go to the scholarship program. The publication of “Seeking and Soaring: Jewish Approaches to Spiritual Direction” shortly before Hanukkah is not a coincidence; the contributing authors and editor think this volume will make a wonderful gift for Hanukkah and many life cycle events. They also believe that rabbis and other leaders of the Jewish community, as well as clergy of other faiths, will appreciate reading this book because it can help them consider the value of Jewish spiritual direction for themselves and those they serve. Many of the chapter authors and Rabbi Milgram are available to offer spiritual direction panels, talks, workshops, and sessions. For additional information see: www.reclaimingjudaism.org.